Undoubtedly, individuals contribute to the construction of social identities and society in turn is influential in forming personal identities. This impact also holds true of translators and can be particularly substantiated within Bourdieu’s sociology and strengthened by Actor-network Theory (ANT). Bourdieu’s habitus, for instance, can associate the notions of identity and agency, which have obvious bearings on translator training. Further, ANT’s network-based conception of social phenomena defines interrelationships and power distribution, hence identity and agency, differently than Bourdieu’s and it can present a rather novel picture of the training setting through its key notions, despite the fact that the idea of constructivism in this theory has already informed translation pedagogy. Looking at the notion of trainee translators’ identities from a sociological perspective, the present study attempts to compare pertinent parameters from Bourdieu’s sociology and ANT to see their correspondence with a West-East distinction. Then, to validate our theoretical discussions regarding the social differences interpretable through sociological insight, and to illuminate how trainee translators’ personal, social, and professional identities are interrelated and how these identities are probably influenced by and influencing translation teaching practices, we carry out a comparative survey of Iranian and Italian students, the results of which indicate that the Iranian students tend to have a more socially-oriented identity, while Italians show a stronger personally-oriented identity. 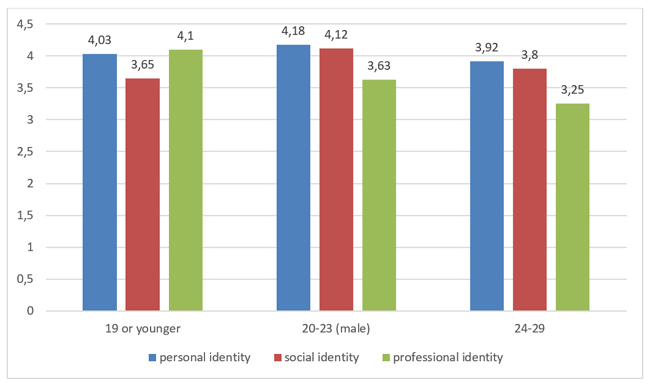 Moreover, with respect to their professional identity, the Italian students’ mean identity score was relatively higher and the microanalysis of three age/gender groups revealed, except for one age group of Italian students, that professional identity correlated positively with personal and social identities of both groups of students. All in all, the findings suggest that it could be fruitful to adopt translator training methods which take into consideration aspects of the student’s identity. ©inTRAlinea & Farzaneh Farahzad & Hamid Varmazyari (2018). "Translators’ Identities within Approaches to Translation Sociology: A Comparative Study of Trainee Translators", inTRAlinea Vol. 20.
but that I negotiate it through dialogue, partly overt, partly internal, with others. Translation sociology has already become one of the in-vogue research interests and areas in both Translation and Interpreting Studies (TS) and Sociology, giving way to understanding and interpreting both old issues in innovative ways and new ones arising from the nature of the diverse sociopolitical and cultural world today. The interdisciplinary nature of research in this area has the potential to encourage scholars to carry out investigations into, inter alia, the interface between self, groups, and society with respect to translational issues, concerns and practices. Analyzing sociological approaches to translation can shed light on how they perceive identities, and by extension trainee translators’ identities, because within each approach translators and translatorial agents can be positioned in specific social roles, which gives them certain social functions that in turn contributes to the construction of their identities. As the roles translators play vary based on contextual factors, translators can and do have multiple identities including personal, social, and professional identities. In addition, identity is an essential concept in education and by extension in translator training because ‘[i]dentities are the traits and characteristics, social relations, roles, and social group memberships that define who one is’ (Oyserman, Elmore and Smith 2012: 69), a definition of the term which indicates the roles of both self and society in the formation of identities. Basically, a reciprocal interaction exists between self and society through a power and identity dynamic where ‘people contrast themselves with others’ and where they also ‘include others in their self-judgments’ (Oyserman, Elmore and Smith 2012: 83). It goes without saying that sociology, and specifically identity, which has been mostly neglected in translator training, can provide important insights if we reflect on the myriad interfaces between training, trainers, trainees, translators and society from diverse standpoints. Clearly, the recent sociological turn in TS has encouraged both scholars and practitioners to explore the relationship between the agents involved in the translation process, product and function and to acknowledge the complexities and subtleties of these relationships, which in turn, has the potential to influence the production and reception of translations. The same applies to translator training as it includes process, product, and function and can be looked at from the viewpoint of one or more of these elements. Chesterman (2006: 12) aptly divides the sociology of translation into three subdivisions: ‘the sociology of translations as products’, ‘the sociology of translators’ and ‘the sociology of translating, i.e., the translation process.’ The present study puts an emphasis on the second of these categories, namely, the sociology of translators with respect to the sociological views of Pierre Bourdieu, and Latour and others’ Actor-network Theory. The sociology of translators and the sociology of translating appear to be tightly interrelated since, translators, as hands-on agents with their own beliefs, interests, and individualities, play a fundamental part in the translation process, which, together with the feedback they receive from translation users, affect and shape their concept of themselves. It follows, then, that sociological and psychological aspects of translation are closely associated: the social interaction and status of translators impacts their mental make-up, their very selves, and vice versa. Habitus can also be simply defined as the internal tendencies on the part of agents, acquired over since from childhood, ‘through the experience of social interactions by process of imitation, repetition, role-play and game participation’ (Swartz 2002: 63), that act on their actions and reactions, behaviors and attitudes. Translators’ internal/external struggles as described above draw on the crux of Bourdieu’s sociology, the dualism of agency-structure, for which Bourdieu offers a solution, i.e., dismissing the deterministic and at the same time the arbitrary nature of actions through his notion of habitus. Thus, starting with Bourdieu’s inter-related theoretical concepts that have obvious bearings on the notion of identity, we will then see how Actor-network Theory (ANT) locates identity-related implications and how the two are different and where they possibly meet. Finally, we will present and analyze the results of a survey conducted on Iranian and Italian undergraduate trainee translators to see how different aspects of their identities are correlated. Since habitus is ‘the performative dimension of identity’ (Schneider and Lang 2014: 92), the survey results will also help to reveal the habitus of Iranian and Italian students at large. Furthermore, there are items in the questionnaire that concern participants’ dispositions, roles, capital, and acts that are all related in one way or another to Bourdieu’s sociology and/or to ANT. Bottero’s (2010) Bourdieu-based components of identity, which will be explained in 1.2, also signify some overlap and relation between this study’s theoretical ground and its empirical part. We are hopeful that the findings of this study will have implications, inter alia, for training translators because identity is a key concept in teaching and learning and in enhancing their quality. Hoyle et al. (1999: 47, as cited in Snel Trampus 2002: 42) hold that Westerners tend to develop self-dependent characteristics, whereas Easterners incline towards interdependence and we can see to what extent this view holds true for the identity aspects of the population of the empirical part of the present study, i.e., Iranian and Italian trainee translators. This general distinction, arising from socialization practices, between Western individualistic societies and Eastern collectivist societies has also been documented by other scholars such as Singelis (1994), Johnson (1993), Bengston et al. (2000), and Schaller (2009). Q1: How similar/different are Bourdieu’s sociology and ANT when it comes to the issues of agency and identity? Q2: To what extent are trainee translators’ personal and social identities related to their professional identities? And how do Iranian and Italian trainee translators differ in terms of their identity? H1: There is a significant relationship between personal/social aspects of identity and those of professional identity. 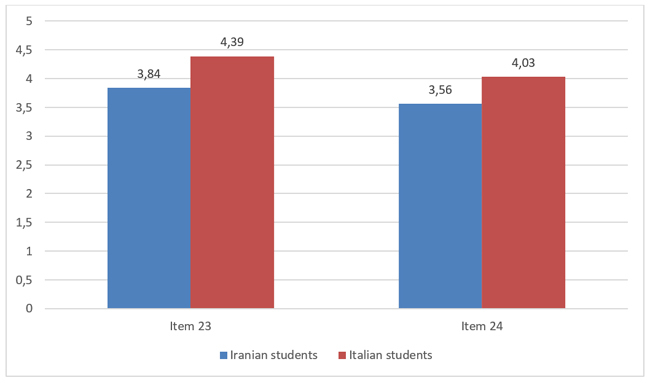 H2: Iranian undergraduate trainee translators tend to have well-developed interdependent identities whereas Italian undergraduates tend to have well-developed self-dependent identities. H3: Iranian and Italian trainee translators differ in terms of their sense of their own identity. We shall begin by defining different types of identity. Personal, individual, group, collective, gender, national, linguistic, cultural, and professional are probably the most established terms with which we refer to identity. Simply put, identity can be defined as what makes an individual/group distinct from others when looked at from a shared dimension such as personality, gender, nationality, culture, etc. Interestingly, this way of defining identity closely resembles the definition of culture, foregrounding the proximity of the two concepts. Both culture and identity find realization in what they are not (referring to); in excluding and in contrast with others. Translators’ identities can be seen as forming through their belonging to, among others, institutions, translators’ groups and training spaces as well as in the roles they play individually in their social interactions and in the cultural constructions and representations the act of translation may entail. In other words, translators’ selves are functions of their social identity and at the same time, they give identity, through their actions, decisions, and beings, to the communities to which they belong. The approaches to sociology that attempt to study the self, according to Stets and Bruke (2003), are differentiated in the social or societal contexts in which individuals’ actions give rise to social structures and concurrently individuals are provided with ‘feedback’ that has a transformative effect on them. This process is similar to seeing one’s self in the eyes of others, giving self a shared meaning combined from self-reflection and others’ observations. Self carries various identities depending on the given situation where certain social roles are performed. A translator, for example, can be identified as professional in their community, an expert by academics, a family member at home, a man/woman of culture by authorities and so forth (Tan 2012). This implies that in social interactions, only parts of an individual's identity are involved in any given situation (Stets and Burke 2003: 8). An immediate implication of this view of translator training as a series of social situations is that trainee translators construct their identities in the educational situations they experience. As mentioned previously, a feature that makes research into identity fascinating yet demanding is the fact that this concept lies at the interface of sociology and psychology, two huge and influential sciences. It is also a reason why teaching is such a complex endeavor. Similarly, translation is both a social and a psychological endeavor. The three types of identities explored in this study need to be defined here. Personal identity can be explained simply as how we define ourselves. Social identity, according to Tajfel (cited in Ashmore, Jussim and Wilder 2001: 6) is ‘that part of an individual’s self-concept which derives from his knowledge of his membership in a social group (or groups) together with the value and emotional significance attached to that membership.’ Finally, professional identity in general is someone’s way of looking at themselves in terms of the values of the profession they are trained in or are members of. ‘Professional identity is often dictated by rigid professional codes of ethics’ (Rudvin 2006: 182). Although Bourdieu himself does not seem to have explicitly defined identity, scholars have investigated this concept based on his theories. For example, Bottero (2010) argues that three components of identity, the reflexive, collective, and dispositional, can be conceived based on Bourdieu’s theory of practice, which points to the emergence of identity from three sources: ‘the interrelations between habitus and field’, ‘the intersubjective relationship between agents’ (Bottero 2010: 6), and one’s dispositions. The dispositional, collective, and reflexive components represent personal, social, and professional identities. The first two are self-explanatory but the third can be explained as the way one’s habitus is related to one’s performance in the social field – for example in the field of translator training. Similarly, as Cressman (2009) points out, the interactions between actors in networks define their identity and because actors can at the same time belong to different networks and depending on the way these interact, their identities can vary. Therefore, in both theories we can consider multiple identities for translators and trainee translators. A group of researchers has investigated the role and the impact of a certain type of identity on translation products and translators’ performance. This group includes Qun Li (2014), who looked at the ‘influence of translators’ cultural identity on the translation of Lun Yu’, which is ‘a book of quotations which mainly records the words and deeds of Confucius and his disciples.’ This research concludes that components comprising a translator’s identity influence his/her translation. A similar study was carried out by Dionysios Kapsaskis (2011). As an example of how the professional identity of translators is influenced by industrial changes, Kapaskis (2011: 163) focuses on the way in which subtitling quality has decreased in recent years, particularly because of ‘outsourcing and the introduction of template subtitling files.’ Kapaskis reflects on how such changes should be considered in translator training. On the other hand, there are studies that have gone the other way round, namely, they have probed the influence of translation on communities, norms, and identities of different types. However, such studies are beyond the scope and the primary aims of the present article. The first is Simeoni’s (1998) pioneering study, considered ‘the locus classicus in translation studies for any work pertaining to translatorial habitus’ (M. Vorderobermeier 2014: 12), in which he investigated ‘the intellectual biography and norms of translators under the “who?” question, or Lefevere’s concept of patronage in revealing the social context, enabling (or discouraging) translations under the “with whose help” question’ (Tahir Gürçağlar 2013: 138). Williams (2013: 104) points out that Simeoni believes that ‘a range of social and professional norms’ influence translators’ decisions but that translators are not passively subject to norms. Contrary to Hermans’ view, Simeoni also doubts that translation can be considered a field (Williams 2013: 104). Moira Inghilleri (2003; 2005) has also drawn on Bourdieu’s concepts of field and habitus to ‘model the habitus of interpreters in UK asylum proceedings’, locating interpreters in ‘“zones of uncertainty” in complying with fluid translational norms’ (Pöchhacker 2013:64). Buzelin’s article ‘Translations “in the making”’ (2007), on the other hand, draws on ANT, and argues for a process-oriented view of translation. She merges ANT with ethnography in order to trace each stage in the translation process of a number of case-studies of literary works. One major conclusion she makes is that ‘Latour’s thinking’ can have two interpretations: a ‘strong form’ and ‘a weaker one’. This weaker interpretation can be applied to TS as ‘a research methodology’ to analyze translation as ‘a production process’ (2007: 165). Latour’s network analysis, Buzelin concludes, helps us to understand the reasons for translations as they are, where the features of translation as a product and the way it is dispersed connect with how ‘linguistic/stylistic decisions’ are studied (Buzelin 2007:165). Chesterman (2006: 13) cites a number of other studies that have employed Bourdieu’s concepts in analyzing translation-oriented research. These include Jean-Marc Gouanvic’s (2002) application of ‘Bourdieu’s model’ to study ‘the emergence of science fiction as a new genre in France after World War II, under the influence of translation’ where he focuses on ‘economic factors, key translators and publishers, marketing practices and book clubs’ which ‘gave rise to a new literary genre in France, not on the actual translating process itself.’ Likewise, Gouanvic (2005) applies Bourdieu’s sociology to analyze the influence of judicial fields on American and French literary fields in which American literature was translated in France during the 19th and 20th centuries. Chesterman also discusses Heilbron’s (2000) study in which he analyzes ‘the international flows of translated books between core and peripheral cultures, as part of a broader globalization process’ using Bourdieu’s sociology (Chesterman 2006: 13). For Bourdieu, realism takes the real to be relational. The notion of the relational is so central to Bourdieu that he preferred to speak not of his ‘theory’ but rather of a ‘system of relational concepts’ (Schinkel 2007: 712). This relationality is, for instance, visible in the relations between the different types of capital that Bourdieu speaks of, as well as in the interconnectedness of his concepts of habitus, capital, doxa, and illusio. Finally, Farahzad and Varmazyari (2017) have applied Bourdieu’s sociology, particularly his concepts of habitus and capital, to translator training. They emphasize the role of socialization in the construction of habitus, which together with the capital trainee translators can gain, are both part of, and influential in, their specialization in the field of translator training. Unquestionably, Pierre Bourdieu’s sociology has been applied in TS more extensively than other sociological theories. His structuralist orientation, reflected in his practice theory and related concepts of agency, field, habitus, capital, doxa and illusio, leaves little doubt of the relevance of his ideas to the sociological analysis of identity, given that, as social agents, individuals work to create social structures which construct their identity in return. It is quite similar to the relationship between the structures of any given field and the agents within that field, while the habitus of agents in the field are ‘structured structures predisposed to function as structuring structure’ (Bourdieu 1997: 72). Habitus is structured based on one’s past experiences and it structures one’s present and future; it is structuring. Based on this structure, habitus creates beliefs, practices, and feelings and it is structured by existing conditions (Grenfell 2008: 51). Habitus, as mentioned above, operates along with other factors. For what we know as practice, Bourdieu presents an equation as follows: [(habitus) (capital)] + field = practice (Grenfell 2008: 51). […] examining the nature of interaction between identities means addressing both social structure and agency. We must go back and forth and understand how social structure is the accomplishment of actors, but also how actors always act within the social structure they create. Bourdieu’s habitus, as interpreted by Grenfell (2008), employs an analogy of a ‘competitive game’, or ‘field of struggles’, resembling each social field of practice. In this game, individuals, groups and institutions compete for better positions. Social agents learn the rules of the game gradually. They are only equipped with their own points of view. The choices of actions here are, according to Bourdieu, not conscious or rational, unlike the accounts in ‘rational choice theory.’ Rather, they are made out of a ‘feel for the game’, i.e., Bourdieu’s notion of illusio. They take time to develop and they are never perfect. Their feel for the game is, in fact, their understanding the social field’s regularities (Grenfell 2008: 54). Actor-network Theory (ANT) was developed by Bruno Latour, Michel Callon and John Law in the 1980s, and has aroused considerable interest among researchers in different fields. ANT has undergone some modifications: originally it aimed at studying ‘technological innovation and scientific progress, as part of the sociology of science’ (Chesterman 2006: 21), but it has increasingly been applied to other sociological fields, including studies of identity. ANT takes a constructivist approach and in this respect, it shows some resemblance to the social constructivism in TS, initiated by Király (2000) in translator training. The main tenet of the social constructivism paradigm is the construction of knowledge through social interactions, including those in classrooms, hence the significance of collaboration and group work. Thus, it can be argued that social constructivism, and by extension ANT, favors a collective approach to identity and its construction due to its concepts of network and translation. The central notion of an actor (or agent or actant) is understood to include both human and nonhuman agents: people interact with machines, computers, books etc., and all these form part of the socio-technical network in which science is done, or in which some new engineering project is undertaken. The network has no centre, all the elements are interdependent. Important roles are played by knowledge systems and by economic factors, as well as by people and by technical aids. Causality is not unidirectional: any node in the network can affect any other node. The theory distinguishes various kinds of relation between the nodes of a network […]. This explanation highlights some of the features of ANT that distinguish it from Bourdieu’s approach: especially the fact that it is non-structuralist as there is no center that keeps the agents in place. Rather, actants covering both human and non-humans (unlike Bourdieu’s focus on human agents) interact within networks whose nodes have bidirectional relations. The interaction between agents or actants is called translation, a concept which ANT borrows from Michel Serres, as Barry (2013: 414) has pointed out. ‘“[T]ranslation” is the way social actors interact so that some can later speak “on behalf of” others (so that translation is at the core of all politics)’ (Windle and Pym 2011: 9). Latour (2005: 57-58) considers agency with a focus on mediators and intermediaries, a dichotomy ANT uses to describe actants. Intermediaries do not affect the forces and meanings they are to transfer but mediators can modify them (Latour, 2005). Thus, the identity of actants is dependent on their roles as mediator or intermediary, which can also change into each other. Most theories are developed by theorists through the evaluation of previous theories and approaches. Latour is no exception for he looked critically at Bourdieu’s sociology and developed his notions of generalized symmetry and the vanishing of boundaries, both of which have influenced the conception of agency and identity within ANT. Generalized symmetry refers to an ‘equal treatment of humans vs. non-humans’ (Luck 2013: 228). In addition, the interconnected nature of networks, where no boundaries can be distinguished, is in contrast to Bourdieu’s sociology that highlights the role of boundaries including capitals, positions, etc. all denoting differentiation. Latour’s sociology reduces society to a network and replaces the agent with an actant. What Latour claims is that ‘in “modern” sociology, society is both too weak and too strong over against objects that are either too strong or too arbitrary’ (Schinkel 2007: 716). In contrast to what Latour calls modern sociology, he describes Bourdieu’s sociology as classic. In ANT, the “actors” can be both people (such as the translator, the editor, the publisher) and artifacts (e.g. the source text and the translation). The existing actors “recruit” or “introduce” new actors into the network; the more powerful actors can recruit more actors. As Schinkel (2007: 714) points out, non-human actors are always taken into consideration in Latour’s works. Thus, as in Bourdieu's theories, power relations are at work in ANT’s actors and in the notion of translation that entails the exercise of power represented in the modification that takes place. But, as we stated above, while Bourdieu’s ‘field’ denotes a center/periphery, ANT’s network has no center. This study aims to look at translators’ identities from a sociological perspective. Starting from a general assumption of the existence of distinctions between Western and Eastern identities, we conducted an identity survey of Iranian and Italian undergraduate trainee translators, to test our hypotheses and to see to what extent the findings would fall within Bourdieu and ANT theories. Additionally, the correlation between personal, social and professional identities among students was briefly examined. A total of 189 trainee translators participated in our survey: 85 Iranians and 104 Italians. The students were from four Iranian and four Italian universities: Arak University, Allameh Tabataba’i University, Imam Khomeini International University, and University of Kashan in Iran; and Forli Campus of the University of Bologna, University of Macerata, University of Modena and Reggio Emilia, and University of Trento in Italy. In line with each country’s curricular program, Iranian junior and senior students and Italian second and third year students were asked to take part. The age and gender distribution of the two groups of students are given in Tables 1 and 2 below. The questionnaire developed for this study was for the most part adopted from Cheek and Briggs’ (2013) AIQ-IV. However, the items concerning students’ professional identity were chiefly developed by ourselves (see the Appendix below for a copy of the questionnaire). AIQ-IV is a questionnaire that measures identity orientation in the four aspects of personal, relational, social and collective identities. Our abridged questionnaire comprised 28 items, plus 4 introductory items requesting students’ personal information, and was administered online. For identity items, we used a five-level Likert scale with answers ranging from “Not important to my sense of who I am” to “Extremely important to my sense of who I am.” Out of the 28 items concerning aspects of identity, 16 were aimed at assessing students’ professional identity, 7 dealt with their personal identities, while 5 were concerned with analyzing the social aspect of their identity. In the original AIQ-IV questionnaire, there are 10 special items that are not scored on scales, two of which were included in our modified questionnaire. The research population was provided with the online questionnaire with an extended time period within which to respond and the responses were recorded both separately for each respondent and in a summary of all responses. To help our analysis, the responses of Iranian and Italian students were recorded separately. The data analysis was conducted by calculating the mean identity scores (1≤score≤5) for both groups of students regarding different aspects of their identity. Then, the total mean scores were compared and interpreted. Additionally, based on the total scores of the responses to each item, items that showed marked distinctions among the two groups of students were singled out as potential indicators of a number of meaningful and enlightening contrasts. Comparing the mean values for all items, the items whose mean scores showed a certain variation were identified and marked for this purpose. The procedure was as follows: first, in each identity aspect, the differences between the mean scores (in personal, social and professional identity aspects) and the score for each single item were calculated for both datasets, then the average score of the lowest difference and the highest difference among the whole items of each identity aspect was obtained, and finally, any item whose inter-group difference score was higher than the value of the average score was marked. The resultant criterion values were .39, .55, and .33 for personal, social, and professional identity aspects respectively. Finally, a microanalysis of identity scores based on three age groups of 19 or younger, 20-23 (male), and 24-29 years old was carried out in order to find out more about the correlation of the identity aspects. Because the majority of students in both datasets were female and belonged to the age group 20-23, it was highly likely that their identity aspects were in line with the overall identity scores, so we decided that analyzing the male students’ identities alone could prove instructive enough. Figure 1 compares Iranian and Italian undergraduate translator trainees in three aspects of their identities. 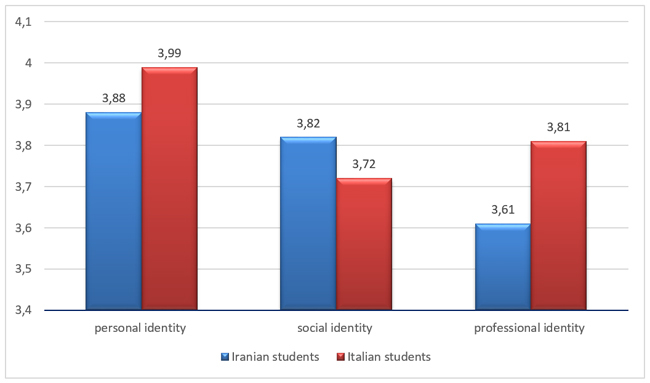 As Figure 1 shows, the Iranian and Italian students surveyed in this study, show a contrast in terms of their personal and social identities where the former tend to have a stronger social identity and the latter a more marked sense of personal identity. This implies that Italian students are more inclined towards individualism and self-dependence while Iranian students prefer interdependence; a difference that may reflect overall differences between Iranian and Italian, or Eastern and Western, societies. As for the correlation between personal and social identities with professional identity, no meaningful correlation was observed, indicating that either there are more factors that have to be taken into account or some complementary data is required. We stated above that a special analysis was carried out of those items which produced significantly different based on the overall scores between Iranians and Italians. The following items were selected for further interpretation in each aspect of identity. 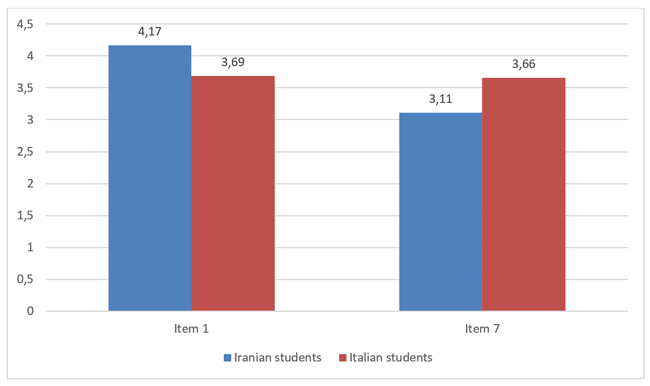 The Iranian students' score was significantly higher than their Italian counterparts in Item 1 but lower in Item 7, which might indicate that although Iranian students display a somewhat more social and less personal identity orientation, they might care more their values and morality issues. On the other hand Italian students felt more intensely and emotionally about their living environments. The results shown in Figure 3 imply that Italians are less concerned about their social popularity. Popularity, as social capital, is a way to earn symbolic capital, which in turn can be arguably converted into other types of capital, particularly cultural capital. Although Italian students showed a higher propensity for individual work, they seem to value professional qualities when working with other people to a higher extent, which is indicated in Item 23; they consider it more important to be valuable co-workers through being reliable and organized. Being reliable is a highly interpersonal attribute while being organized tends to be a personal characteristic yet with palpable outcomes for the people around us. Furthermore, in reference to Item 24, Italian students seemed to consider their future job much more important than Iranian students, a result which could imply two things: first, they see their job as a main contributor to their identity; second, they would prefer to have (and probably see better prospects in) a translation-related job. Overall, in the majority of the professional identity items, the Italian students demonstrated a stronger orientation, which may indicate that they generally have a better image of their field-related abilities and prospects for developing their careers in translation. As a final step in this survey, we explored the correlation between personal and social identity aspects on the one hand with professional identity on the other. To this end, three age groups of trainee translators were compared in terms of their mean identity scores. Figure 5 and Figure 6 display the findings, indicating a chiefly positive correlation between the three identity aspects in the age groups analyzed – except for Italian students of 19 years or younger. Interestingly, professional identity scores were inversely proportional to the students’ age. Another finding was that because the comparison of the mean scores of personal and social identities in these three age groups did not differ significantly across the two national groups, we can conclude that the excluded age group, female students aged 20-23, had a significant influence on the overall identity variation between Iranian and Italian students. The study has sought to shed light on translators’ identities from the perspective of two sociological theories: Pierre Bourdieu’s theory of practice and Actor Network Theory. We also carried out a survey in which aspects of trainee translators’ identities were explored on the basis of a comparison between Iranian and Italian students. The different items of the questionnaire, as well as the identity aspects it addressed, were related to the concepts discussed in the sociological theories. 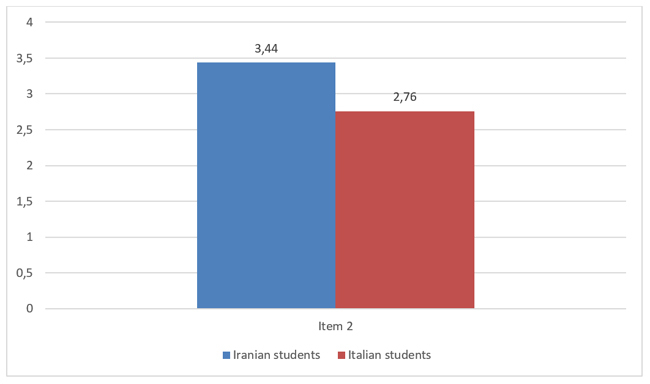 The results of our empirical analysis point to a stronger social identity and habitus for Iranian students and a stronger personal and professional identity orientation and habitus on the part of the Italian students; a result which suggests that social activities in translator training may be particularly suitable in an Iranian context, while personal activities maybe more suitable when training translators in an Italian context. 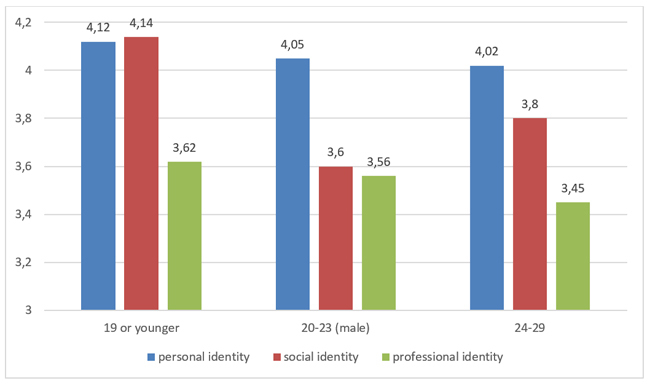 In addition, we found a predominantly positive correlation between personal and social identities with professional identity among the age groups we decided to study for the purpose of correlation analysis. Bourdieu’s sociology tends to be applicable, based on Chesterman's classification, to the sociology of translators and translations but ANT lends itself to be used in the sociology of translating, as it chiefly concerns the translation process. Considering the orientation to process, product, and function that are significant when looking at both translation and translator training, we may consider ANT to be essentially process-oriented, whereas Bourdieu’s concepts tend to be suitable for analyzing process, product, and function. Furthermore, the issue of power is visible and inherent in both theories: in Bourdieu, it is the capital that allows agents to move up to better positions and in ANT, powerful actors can recruit more actors whether humans or non-humans. More powerful agents, thus, have a stronger role, in determining the identity of the subordinate agents or the identity of fields and networks on a larger scale. That ANT gives agency to non-humans can reflect the significance of translation tools and teaching tools in translating and translator training respectively. Moreover, in ANT, agency results from the interactions between actancts, while Bourdieusian agency is determined by a number of factors such as position in the field as well as habitus and field structures. Bourdieusian identity thus tends to be more individual, personal and competitive whereas Latourian identity, as reflected, for instance, in its tenet of social constructivism embodied in its key concepts of network, mediator and intermediary, has a propensity for being social and cooperative. This allows us to tentatively suggest that ANT fits the Eastern interdependent sense of identity more closely, while Bourdieusian sociology tends to be more applicable to the Western independent sense of identity, despite the fact that the concepts in both theories are equally useful in analyzing social developments and phenomena. It can be inferred that when translators move from one society to another, with visible personal and interpersonal distinctions, they are likely to encounter identity problems – at least initially. Based on the survey conducted as part of this research, our first hypothesis was partially confirmed. There was some positive correlation between the professional identity and personal and social identities of trainee translators. Our second and third hypotheses were fully confirmed: Iranian and Italian trainee translators tended to have interdependent and independent identities respectively. This confirms the view of Hoyle et al. (1999) and corresponds to Latourian and Bourdieusian sociologies. Furthermore, Italian and Iranian students differed more or less in the three personal, social, and professional aspects of identity investigated. Nonetheless, a general pattern of similarity in the two groups’ responses to the same questionnaire items was observed. An implication of this study in translator training might be that once we understand that different societies have different conceptions of identity as well as various identities and identity construction patterns – for example, the general distinction between individualistic Western and the social Eastern identity – then our training priorities will differ, with implications for our translation curricula, pedagogies and teaching methods. Furthermore, Bourdieu’s sociology and ANT can help us to define identity parameters in the formation of trainee translators. Additionally, the types of power distribution observed in the two theories have clear implications for the description of educational practices, including translator training. While a Bourdieusian perspective may inspire a competitive nature on the part of students’ class activities, ANT promotes completive and cooperative work. Thus, in the former, trainees’ personal identity is in focus, while the latter places attention on their social identity. Introducing the two sociologies into the classroom allows learners to experience different identity constructions, which is recommended today. We would like to extend our deep gratitude to Prof. Marcello Soffritti and Prof. Christopher Rundle for their invaluable help with the project this study was part of. We would also like to thank Prof. Silvia Bernardini for her constructive comments on a draft of this manuscript. Our heartfelt thanks also go to all the Italian and Iranian colleagues who helped with the distribution of our survey as well as the survey participants. 1. How old are you? * Mark only one oval. 2. To what gender identity do you most identify? * Mark only one oval. 3. Where were you born/are a citizen? * Mark only one oval. 8. My thoughts and ideas * Mark only one oval. Ashmore, Richard D., Lee Jussim, and David Wilder (eds) (2001) Social Identity, Intergroup Conflict, and Conflict Reduction, Oxford, Oxford University Press. Bengston, Vern L., Keong-Dong Kim, George C. Myers, and Ki-Soo Eun (eds) (2000) Aging in East and West: Families, States, and the Elderly, New York, Springer Publishing Company. Bottero, Wendy (2010) “Intersubjectivity and Bourdieusian approaches to ‘identity’”, Cultural Sociology, 4, no. 1: 3–22. Bourdieu, Pierre (1977) Outline of a theory of practice, trans. R. Nice, Cambridge, Cambridge University Press. Bourdieu, Pierre (1990) In other words: Essays towards a reflexive sociology, trans. M. Adamson, Stanford, CA: Stanford Univeristy Press. Buzelin, Hélène. (2007) “Translations “in the making”“ in Constructing a Sociology of Translation, Michaela Wolf and Alexandra Fukari (eds), Amsterdam, John Benjamins Publishing Company: 135–170. Chesterman, Andrew (2006) “Questions in the sociology of translation” in Translation Studies at the Interface of Disciplines, João Ferreira Duarte, Alexandra Assis Rosa, and Teresa Seruya (eds), Amsterdam, John Benjamins Publishing Company: 9–27. Farahzad, Farzaneh, and Hamid Varmazyari (2017) “A Bourdieusian Perspective on Translator Training: Sociological Reflections and Implications”, Translation Studies Quarterly, 15, no. 59: 117–134. Fentress, James, and Christopher Wickham (1992) Social Memory, Oxford, Blackwell Publishers. Gouanvic, Jean-Marc (2002) “The Stakes of Translation in Literary Fields”, Across Languages and Cultures, 3, no. 2: 159–168. Gouanvic, Jean-Marc (2005) “A Bourdieusian Theory of Translation, or the Coincidence of Practical Instances. Field, ‘Habitus’, Capital and ‘illusio’”, The Translator, 11, no. 2: 147–166. Grenfell, Michael (ed) (2008) Pierre Bourdieu: Key Concepts, Durham, Acumen Publishing Limited. Heilbron, Johan (2000) “Translation as a Cultural World System”, Perspectives, 8, no. 1: 9–26. Hoyle, Rick H (1999) Selfhood : identity, esteem, regulation, Oxford, Westview Press. Inghilleri, Moira (2003) “Habitus, field and discourse: Interpreting as a socially situated activity”, Target, 15, no. 2: 243–268. Inghilleri, Moira (2005) “Mediating Zones of Uncertainty: interpreter agency, the interpreting habitus and political asylum adjudication”, The Translator, 11, no. 1: 69–85. Johnson, Frank A. (1993) Dependency and Japanese Socialization: Psychoanalytic and Anthropological Investigations in Amae, New York, New York University Press. Király, Donald (2000) A Social Constructivist Approach to Translator Education: Empowerment from Theory to Practice, Manchester, St. Jerome Publishing. Kapsaskis, Dionysios (2011) “Professional identity and training of translators in the context of globalisation: The example of subtitling”, The Journal of Specialized Translation, 16: 162–184. Kluttz, Daneil N., and Neil Fligstein (2016) “Varieties of Sociological Field Theory” In Handbook of Contemporary Sociological Theory, Seth Abrutyn (ed), Cham, Springer: 185–204. Latour, Bruno (2005) Reassembling the social: An introduction to Actor-Network-Theory, Oxford, Oxford University Press. Luck, Jo-Anne (2013) “Actor-Network Theory: A Device for Reimagining Participants in Education Research” in The Role of Participants in Education Research: Ethics, Epistemologies, and Methods, Warren Midgley, Patrick Alan Danaher and Margaret Baguley (eds), New York, Routledge: 226–240. Oyserman, Daphan, Kristen Elmore, and George Smith (2012) “Self, Self-Concept, and Identity” in Handbook of Self and Identity, 2nd ed, Mark. R. Leary and June Price Tangney (eds), New York, The Guilford Press: 69–104. Pöchhacker, Franz (2013) “The position of interpreting studies” in The Routledge Handbook of Translation Studies, C. Millán & F. Bartrina (eds), Oxon, Routledge: 60–72. Rudvin, Mette (2006) “Negotiating linguistic and cultural identities in interpreter-mediated communication for public health services” in Sociocultural Aspects of Translating and Interpreting, Anthony Pym, Miriam Shlesinger, and Zuzana Jettmarová (eds), Amsterdam, John Benjamins: 173–190. Schaller, Mark, Ara Norenzayan, Steven J. Heine, Toshio Yamagishi, and Tatsuya Kameda (eds.) (2009) Evolution, Culture, and the Human Mind, New York, Psychology Press. Schinkel, Willem (2007) “Sociological discourse of the relational: the cases of Bourdieu & Latour”, The Sociological Review, 55, no. 4: 707–729. Schneider, Jens, and Lang, Christine (2014) “Social mobility, habitus and identity formation in the Turkish-German second generation”, New Diversities, 16, no. 1: 89–105. Simeoni, Daniel (1998) “The pivotal status of the translator's habitus”, Target, 10: no. 1: 1–39. Singelis, Theodore, M. (1994) “The measurement of independent and interdependent self-construals”, Personality and Social Psychology Bulletin, 20, no. 5: 580–591. Snel Trampus, Rita D. (2002) “Aspects of a theory of norms and some issues in teaching translation” in Translation Studies: Perspectives on an Emerging Discipline, Alessandra Riccardi (ed), Cambridge, Cambridge University Press: 38–55. Stets, Jan E., and Peter J. Burke (2003) “A Sociological Approach to Self and Identity” In Handbook of Self and Identity, Mark. R. Leary and June Price Tangney (eds), New York, The Guilford Press, 128–152. Tahir Gürçağlar, Şehnaz (2013) “Translation history” in The Routledge Handbook of Translation Studies, Carmen Millán and Francesca Bartrina (eds), Oxon, Routledge: 131–143. Tan, Zaixi (2012) “The translator’s identity as perceived through metaphors”, Across Languages and Cultures, 13, no. 1: 13–32. Williams, Jenny (2013) Theories of Translation, Hampshire, Palgrave Macmillan. Windle, Kevin, and Pym, Anthony (2011) “European thinking on secular translation” in The Oxford Handbook of Translation Studies, Kirsten Malmkjær, and Kevin Windle (eds), Oxford, Oxford University Press. Farzaneh Farahzad is Professor in Translation Studies at the Department of English Translation Studies of Allameh Tabataba’i University, Iran. Hamid Varmazyari is a PhD candidate of Translation Studies at the Department of English Translation Studies of Allameh Tabataba’i University, Iran. After completing his MA in Translation Studies at Shahid Beheshti University, he started his translator training career in 2009 and has ever since taught undergraduate translation courses mainly at Arak University, where he got his BA in English Translation in 2005. He attended the University of Bologna once as a PhD student in 2013, and another time as a doctoral visiting student in 2016.